The Alamosaurus name means Alamo Lizard. Fossils were mostly found in New Mexico. The Alamosaurus is classifed as a Titanosauria. In 1922, Charles Gilmore first discoveried a few fossils. In 1946 he found a more complete specimen in Utah, consisting of a complete tail, a right forelimb complete except for the tips of the toes, and both ischia. There has been many findings over time including a juvenile skeleton from Texas. There has not been a skull discovered yet, though. Only a few teeth. The herbivore Alamosaurus is about 69 feet long with the estimated weight of 33 tons. 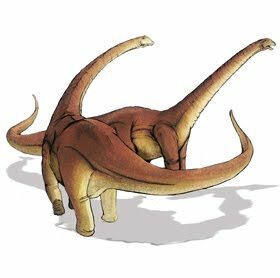 Much like other Sauropods it had a very long neck and tail. It also walked on all four legs.